The TE 55 Lubricity Test Machine is a multi-function unit with adapters for ball on cylinder (BOCLE type) and cylinder on cylinder (TAFLE type) and crossed cylinder contact (Brugger and Reichert type) configurations. The control unit includes a SLIM 2000 Serial Link Interface Module and COMPEND 2000 Windows based control and data acquisition software. The main unit is based on the TE 53 Multi-Purpose Friction and Wear Tester. The machine may be used for evaluating both fuels and lubricants and any other general tribological tests involving sliding or sliding and rolling contacts, but does not aim to meet the requirements of any specified test standard. 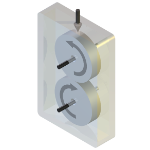 A bearing housing carries two parallel shafts. The lower shaft carries a flat profile ring or roller and is connected to an ac geared motor with frequency inverter variable speed drive. In ball on cylinder configuration the upper shaft carries a holder for the fixed specimen and is restrained from rotating. 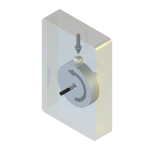 In two roller configuration the upper shaft carries a roller and is driven from the lower shaft through a pair of gears. Seven fixed amounts of percentage slip are provided. 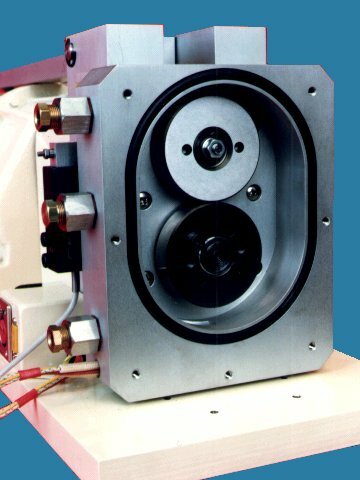 The upper roller is mounted on a self-aligning bearing to achieve full width line contact between the specimens. The TE 55 features a sealed chamber surrounding the test specimens and this allows for the continuous supply of conditioned test fluid into the contact zone, a vital part of controlling the conditions of the test or running with the contact fully immersed with test fluid. The enclosure incorporates a heater element to maintain the test fluid temperature. The TE 55 has PC based sequence programmable control and data acquisition. This is provided by an integrated Serial Link Interface Module and COMPEND 2000 software running on a host PC, operating under Windows. Data is stored to hard disc in standard spread sheet compatible file formats (.csv or .tsv).